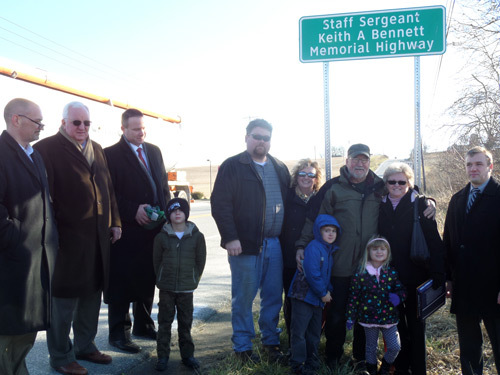 Family and friends joined to honor Keith Bennett, a local hero who fearlessly protected both U.S. Marine Corps military police and Iraqi policemen. Pictured (left to right) are Lancaster County Commissioners Craig Lehman, Dennis Stuckey and Scott Martin. Hayden Martin (son of Scott Martin), Martin Daley (brother-in-law), Tina Daley (sister), Owen Keith Daley (nephew), Tom Miller (step-father), Olivia Daley (niece), Lucy Miller (mother) and Rep. Bryan Cutler. HARRISBURG – Rep. Bryan Cutler (R-Peach Bottom) announced that a portion of Pennsylvania Route 272 in Lancaster County, south of Route 372 and before Osceola Road, will be renamed as the Staff Sgt. Keith Bennett Memorial Highway. During the nine years Bennett, formerly of Holtwood, spent in the Pennsylvania National Guard, he traveled to Saudi Arabia and Iraq. In Iraq, he was killed on Dec. 11, 2005, when a driver detonated a bomb in a truck after he stopped for inspection outside of a compound Marines used to train Iraqi police officers. “Bennett thought his experience in the National Guard would help him become a state police trooper. Naming a section of the highway after him allows his spirit to protect his family and all those who travel that way; the military policeman will now safeguard the streets at home. We’re able to honor a hero by helping him realize his dream,” Cutler said. The legislation to honor Bennett was made possible by Act 197 of 2014, which Cutler supported. He had the pleasure to work cooperatively with Sen. John Rafferty and his staff, who helped to make the highway naming possible by the end of the year.